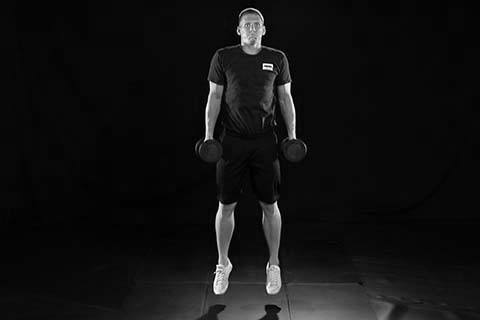 The dumbbell jump shrug is an ideal movement to work on vertical power in your strength training. This exercise is key in the transition from a strength work phase into a speed phase. Dumbbells are utilized in lieu of a barbell for developmental athletes, or with athletes that are trying to generate more hip speed. Keep in mind that the focus is hip speed; do not use dumbbells that are too heavy, as this will not allow you to achieve optimal velocity or power. Starting in a hang position (dumbbells are not resting on box/plates), distribute weight evenly across your feet, bend your knees lowering your body to a quarter squat, dumbbells are at mid-shin height, chest is up and back is flat. Initiate movement by pushing your body away from the floor with you feet. This will help you engage in a full triple extension: ankles, knees, and hips. With the momentum of the triple extension, jump as high as you can lifting the shoulders at the climax of the jump. Bend your knees as you land to help absorb the weight, touching down as softly as possible. Take a slight pause between reps in order to regroup and refocus on generating hip speed. These reps are individual exertions of power.